Shibuya (渋谷) is the town of youth. Everything hip gathers. If you want to check out Japanese young people visit Shibuya. The town is the most fashionable people come especially between late teens and early twenties. Shibuya 109 is the building in which thousands of famous fashion stores are located. The name 109 is becoming the bland. Young people come here to study each others, check out each others and improve each others. That's why Shibuya has been the fashion leader for more than 20 years. Those stores are not only fashionable, but also reasonable, too. When you come to Shibuya, you will find out Japanese young generation is like. As of 2005, Shibuya had an estimated population of 195,877 and a density of 12,960 persons per km2. The total area is 15.11 km2. Shibuya is a shopping and eating district popular with a lot of young Japanese and the center of Japanese youth culture and it shows. Shibuya deserves a prize as the district with more two-storey televisions than any other area in the world. Most of the action in Shibuya is in the hectic blocks to the northwest of the JR station. The best place to get oriented is the Hachiko exit, which opens onto the five-way "scramble crossing" under the giant video screen. Shibuya has lots and lots of interesting shopping opportunities. It's the home of the huge Tokyu conglomerate (railways, department stores, hotels, housing developments), and thus practically every major store in the area has Tokyu in its name. PARCO, 0101, and 109 Building are the fashion leader of Japanese people. You will able to buy any kinds of latest Japanese fashionable outfit in those mall buildings. There are couple of huge book stores, party goods shops, and record stores. The entertainment in Shibuya, there are movie theaters and electronics stores nearby, Karaoke, night clubs, Pubs, and Izakaya. 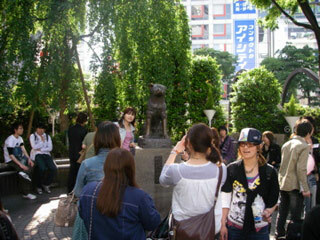 On the NorthWest side of Shibuya station, there is a popular meeting place with a statue of Hachiko the dog, while on the NorthEast side of Shibuya station there is another popular meeting place with a statue called "Moyai". The statue resembles a Moai statue, and it was given to Shibuya by the people of Niijima Island in 1980. Eighteen embassies are located in Shibuya.